NASA launched an unprecedented Earth-observing satellite from California today (Oct. 28) in a dazzling predawn blastoff that created an artificial sunrise as its rocket soared toward space. An unmanned Delta 2 rocket launched the new National polar-orbiting operational environmental satellite system Preparatory Project — or NPP for short — from California's Vandenberg Air Force Base at 5:48 a.m. EDT (0948 GMT) Friday. 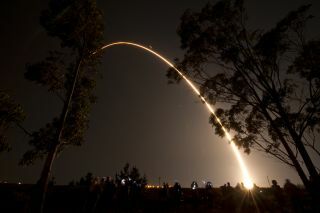 "Liftoff of the Delta 2 with the NPP satellite, blazing the way in new technology for climate research and weather forecasting," said NASA launch announcer George Diller as the rocket rose off the pad into the dark California skies. "We know it'll become a significant part of our nation's climate and weather monitoring system," said Andrew Carson, NPP program executive at NASA headquarters in Washington, two days before the launch. NASA's NPP climate and weather satellite launches atop a Delta 2 rocket from Vandenberg Air Force Base in California in the predawn hours of Oct. 28, 2011. The minivan-size NPP weighs about 4,500 pounds (2,041 kilograms) and follows in the footsteps of other NASA Earth-observing satellites, venerable craft such as Terra, Aqua and Aura. But NPP will deliver even more capability, researchers said. From its polar-orbiting perch 512 miles (824 kilometers) above Earth, NPP is expected to measure more than 30 different climate variables, including sea and land surface temperatures, global ice cover, atmospheric ozone levels and vegetative productivity. The satellite will send about 4 terabytes of data — the equivalent of 800 DVDs — home to Earth every day. NPP's observations should help meteorologists improve their weather forecasts and assist scientists seeking to understand longer-term climate changes and impacts, researchers said. NPP will also help monitor natural disasters such as volcanic eruptions, wildfires and floods, they added. The satellite has a design life of five years, so it should keep observing through at least the end of 2016. While NPP should make plenty of worthwhile observations on its own, it's also valuable as a bridge to the United States' next generation of Earth-observing satellites, researchers said. NPP was originally conceived, after all, as a demonstration mission for the joint military-civilian National Polar-orbiting Operational Environmental Satellite System (NPOESS). Delays and rising costs caused NPOESS to be canceled in 2010, and the military and civilian sides were directed to come up with their own satellite lines. The NPP mission will help test out technologies for the JPSS system, the first satellite of which is slated for launch in late 2016, researchers said. "The observations from NPP are needed for the forecasts today, as well as being another link in the chain of ongoing data observations," said Jim Gleason, NPP project scientist at NASA's Goddard Space Flight Center in Greenbelt, Md. NPP was not the only satellite delivered to orbit by the Delta 2. The rocket also lofted six cubesats, tiny satellites measuring just 4 inches (10 centimeters) across or so. The cubesats were designed by students from several different universities and flew as part of NASA's Educational Launch of Nanosatellites program. Note: If you snapped an amazing photo of today's NPP launch and would like to share it with SPACE.com for possible inclusion in a story or gallery, please send it to senior writer Mike Wall at mwall@space.com.